Ischemic stroke is the top cerebral vascular disease leading to disability and death worldwide. Accurate and automatic segmentation of lesions of stroke can assist diagnosis and treatment planning. However, manual segmentation is a time-consuming and subjective for neurologists. In this study, we propose a novel deep convolutional neural network, which is developed for the segmentation of stroke lesions from CT perfusion images. The main structure of network bases on U-shape. We embed the dense blocks into U-shape network, which can alleviate the over-fitting problem. In order to acquire more receptive fields, we use multi-kernel to divide the network into two paths, and use the dropout regularization method to achieve effective feature mapping. In addition, we use multi-scale features to obtain more spatial features, which will help improve segmentation performance. In the post-processing stage of soft segmentation, we use image median filtering to eliminate the specific noises and make the segmentation edge smoother. 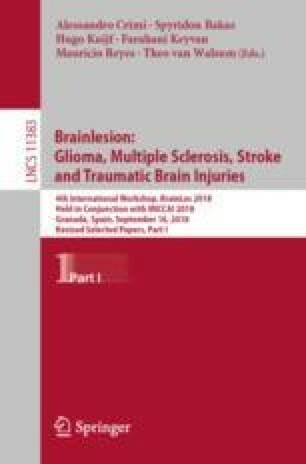 We evaluate our method in Ischemic Stroke Lesion Segmentations Challenge (ISLES) 2018. The results of our approach on the testing data places hight ranking.